Two major mysteries were solved in “Part 12,” a geographically and tonally sporadic episode of “The Return”: We found out what the “blue rose” referred to, and Audrey Horne (Sherilyn Fenn) made her 2017 debut. As exciting as the latter point sounds, but ultimately didn’t prove to be, first things first: Did Gordon Cole (David Lynch) invent “The X-Files”? Forgive us for the meta pop culture diversion, but Albert’s (Miguel Ferrer) exposition dump in recruiting Tammy (Chrysta Bell) to The Blue Rose task force triggered alarm bells. To sum up, Albert told the prospective new member that a few years after the government conducted a massive cover-up regarding the existence of UFOs, the military and FBI secretly joined forces to investigate the unsolvable leftover cases, and Gordon, Albert, and Cooper have been looking for answers ever since. Alas, ’twas not to be, but there was plenty more to enjoy. As fun as it is to imagine task force leader David Bowie (a.k.a. Phillip Jeffries) teaming up with Kyle MacLachlan, David Lynch, and Chris Isaak (as Chet Desmond, of “Fire Walk With Me” fame), there’s more to the scene than revivals of iconic ’90s television shows referencing each other. For one thing, this development spells serious trouble for Tammy. Albert’s warning about past agents who disappeared after joining the Blue Rose team can’t be good news for the most expendable character of the lot; not with the series’ history of treating women as victims (and not with Gordon’s appreciative eye already wandering to a French hotel guest). If he’s not watching Tammy, no one is. But the scene itself is a magnificent combination of mise-en-scène and foreshadowing. Yes, Tammy is likely a goner based on everything mentioned above, but also because of how the scene was framed: Those deep crimson curtains were right behind her, not Gordon or Albert. They’re coming at this from a place of knowledge, but her ignorant leap into the mysterious unknown might cost her once the Blue Rose task force crosses through the curtains to the other side. 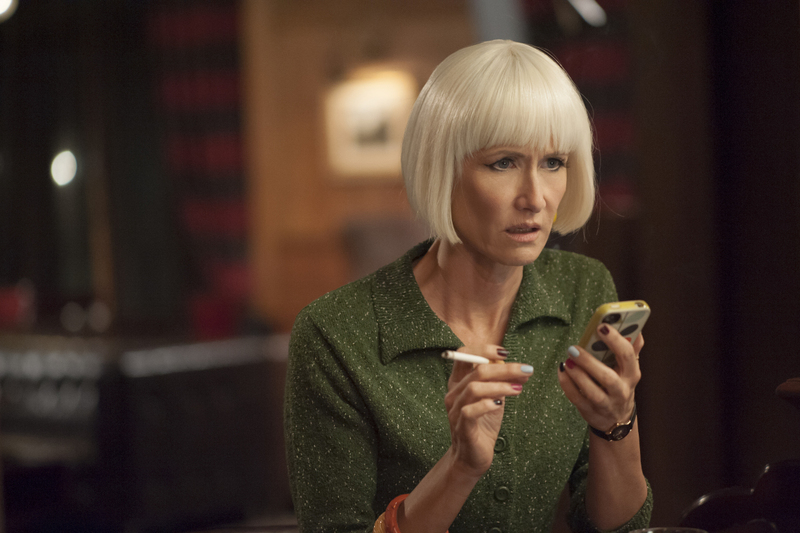 Countering Tammy’s unfamiliarity is the commanding presence of Diane (Laura Dern), who comes striding through the same familiar curtains on the opposite side of the room. Her entrance, majestic as always — as well as her telling communication with someone on the other side — hint that Diane might be better suited for extra-dimensional travel than her deputy status designates. Maybe she’s gone through before, or maybe she holds the key to surviving. Either way, these two women — both of whom, it should be noted, appear to be under the control of men — will play a major role once everyone takes a trip to the Black Lodge. 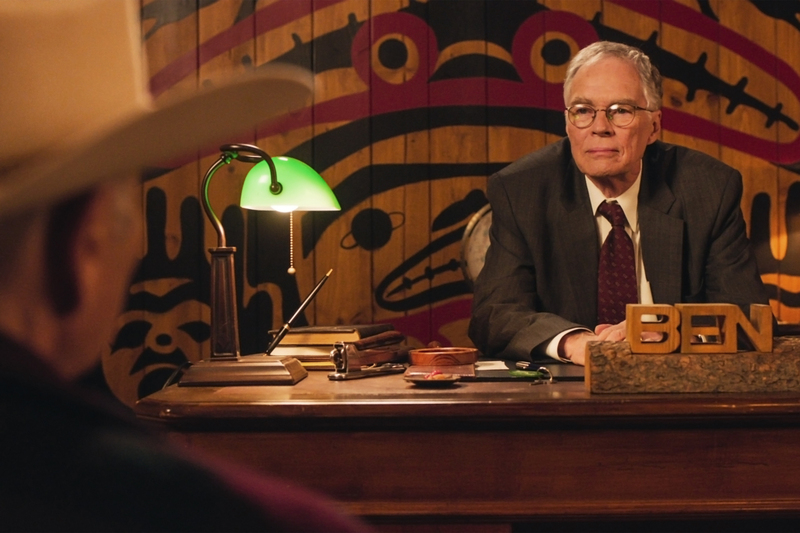 Aside from Gordon’s incredible “turnip” pun, the episode’s second best highlight came in the form of another blunt conversation, this time between Sheriff Truman (Robert Forster) and Ben (Richard Beymer). There to inform Ben of his grandson’s malicious act, Sheriff Truman sat patiently and listened to a man wracked with guilt. Ben spoke of an unwieldy bicycle his father got for him that, despite its unhelpful giant wheels, meant the world to him. “I loved that bike that my father got for me,” Ben said. Treacle like this isn’t often as moving as it was coming from Ben. “Twin Peaks” often employs overt sentimentality as a means to emphasize lost purity, and, technically, that still applies here: Ben’s grandson, Richard, represents now while Ben is part of the past. Richard didn’t have a father like Ben did, and look where he ended up. The only difference between this and scenes like the Shelly/Red/Bobby love triangle in the diner last week is that Ben’s romantic notions are absent a knowing wink.